Ukrainian Catholic Archbishop Emeritus Stefan Soroka arrives for a prayer service at the Ukrainian Catholic Cathedral of the Immaculate Conception on Sunday. When Pope John Paul II named Bishop Stefan Soroka to lead the Ukrainian Catholic Church in the United States, the appointment was groundbreaking and controversial. Not only was Soroka, at 49, the youngest cleric ever to be named archbishop of the Philadelphia Archeparchy, the titular head of the U.S. denomination, but he was an outsider. Soroka was born in Winnipeg in Manitoba, Canada. Some American-born clergy and parishioners wondered: "Why not one of our own?" Archbishop Emeritus Stefan Soroka says his farewell. For 17 years, Soroka has presided over a 100,000-member national church in transition. 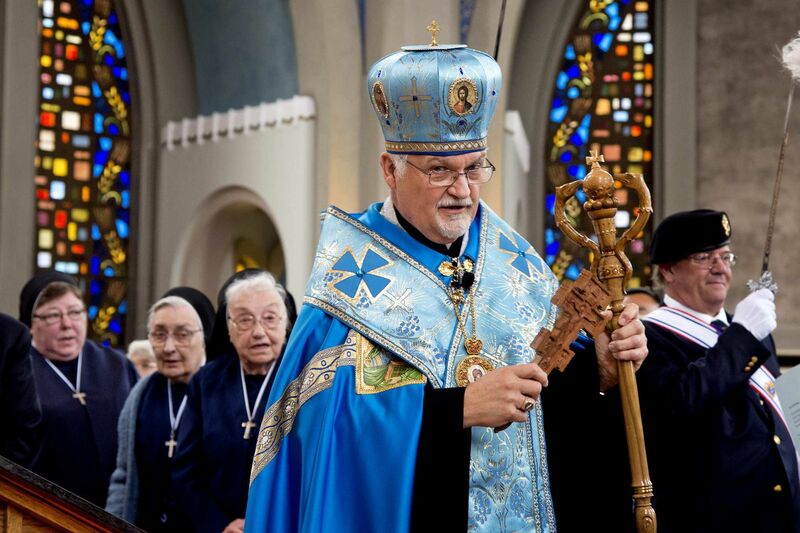 He has led the nation's Ukrainian Catholics as membership has declined and immigrants from Ukraine have helped to replenish the pews, all while coping with health challenges that include a heart condition and cancer. Earlier this year, he decided to follow his doctor's advice and resign from his duties. On Sunday, a crowd of more than 600 filled the Cathedral of the Immaculate Conception in Northern Liberties to honor him and say goodbye. "I apologize for the shock of my decision, It took me three months to heed my cardiologist's advice," said Soroka, resplendent in sky blue vestments as he stood before the congregation. "I feel great sadness having to say farewell to you, people I have grown to love, respect and appreciate. You have taught me so much." Soroka submitted his resignation to Rome earlier this year. Pope Francis accepted it on April 16, making Soroka an archbishop emeritus. Bishop Andriy Rabiy, 42, who was born in Lviv, Ukraine, and serves as pastor of Nativity of Blessed Virgin Mary Ukrainian Catholic Church in Reading, has been appointed to serve as apostolic administrator until a replacement is named by the pope, "perhaps by December," Soroka said. The Ukrainian church is one of 23 Eastern Rite churches that are part of the international Catholic Church. Though under the jurisdiction of the Vatican, Eastern Rite churches, which represent about 16 million parishioners, are largely autonomous and operate independent of Roman Catholic archdioceses. Their liturgies resemble Eastern Orthodox worship. Eastern rite priests in North America were not permitted to marry until 2014, when the Holy See lifted the ban. Eastern rite priests elsewhere, including in Ukraine, had been permitted to be married. As archbishop of Philadelphia, Soroka — who himself is unmarried — led a national church that is divided into four regions headquartered in Chicago, Stamford, Conn.; Parma, Ohio; and Philadelphia, the largest, with 50,000 members in Eastern Pennsylvania, New Jersey, Delaware, Maryland, Virginia and Washington. Over his near 20-year tenure, Soroka has battled the challenges that many congregations in institutional religion are facing as young people drift away, congregations shrink and shutter, and the remaining parishioners get older. Local membership has declined from about 72,500 in the late 1990s to 50,000. The church also is grappling with a shortage of priests and the challenge of helping immigrant Ukrainians adapt to their new country. Sister Sofronia with the Sisters Servants of Mary Immaculate, from Sloatsville, NY is surprised by the "gift" of a prayer book delivered down the aisle by 17 month-old Diana Pylypchak, who was attending the service with her parents from Rockville, MD. To manage the changes, Soroka has led a reorganization that included closing seven churches, and merging two parishes (four of the closings and the merger were in Philadelphia.) He has implemented a plan to repurpose buildings at the archeparchy's two-block headquarters on Franklin Street, which includes leasing one building that is scheduled to open as a senior center later this month. Membership declines have been partially mitigated by the immigration of Ukrainian Catholics to the region. New parishes have opened in Lancaster and Front Royal, Va. To find clergy, Soroka traveled to Ukraine, where priestly vocations are thriving. He placed 17 immigrant priests and their families in U.S. parishes and ordained five men into the priesthood. "He will be remembered as the metropolitan during whose tenure the ordination of married men to the priesthood was publicly brought forward," said the Rev. Andriy Chirovsky, a founding director and religion professor at the Metropolitan Andrey Sheptytsky Institute of Eastern Christian Studies at the University of St. Michael's College in Toronto. "That was a big breakthrough." The son of a homemaker and a railroad laborer, Soroka counseled offenders on probation as a social worker before entering the priesthood. He was dating a girlfriend and considering marriage and a family, when the call to the ministry became too loud to ignore. He went on to earn a bachelor's degree in sacred theology from the Catholic University of America in 1978 and studied at St. Josaphat Ukrainian Catholic Seminary, in Washington, D.C. He was ordained in 1982 and served as a parish priest and administrative in the Winnipeg Archeparchy in Manitoba. He was named a bishop in 1996, then the youngest in Canada. Soroka was appointed by Pope John Paul II in November 2000 to replace Archbishop Stephen M. Sulyk, of the Philadelphia Archeparchy, who resigned at age 76. At the start of Sunday's ceremony, Soroka marched in, last in a long procession of clergy, Knights of Columbus, and Boy Scouts. Little girls dressed in blue and yellow, the colors of the Ukrainian flag, scurried around the ornate cathedral. The choir, standing on a balcony, solemnly sang "It is truly right" as Soroka marched down the aisles to the altar. Myroslawa Hill, of Cinnaminson, and Helen Chaykowski, of Philadelphia, sat together in the pews. The two friends called Soroka a gracious leader. He had appointed a married priest to their church, Annunciation Blessed Virgin Mary Ukrainian Catholic Church in Melrose Park. The appointment was the first time the congregation had ever had a married cleric, which both women said had been working out "just fine." Soroka says he has strived to make the church and its leadership more approachable, chipping away at the respectful distance that separates clergy and the people in the pews. He has been involved in neighborhood issues and built relationships with local clergy. He started a plan to make the church more tech-savvy by turning a meeting room into a place equipped to host online religious classes, but wishes he had done more. The nation's Ukrainian bishops will nominate three candidates to succeed Soroka, and the pope will make the final decision. Soroka hopes his successor will be a risk-taker unafraid to try new things. In July, he will leave Philadelphia for Winnipeg, where he plans to write, lead retreats and take care of his health. He asked the crowd gathered Sunday to pray for him, and told them: "I will pray for you." A parishioner records the event, at the Ukrainian Catholic Cathedral of the Immaculate Conception.